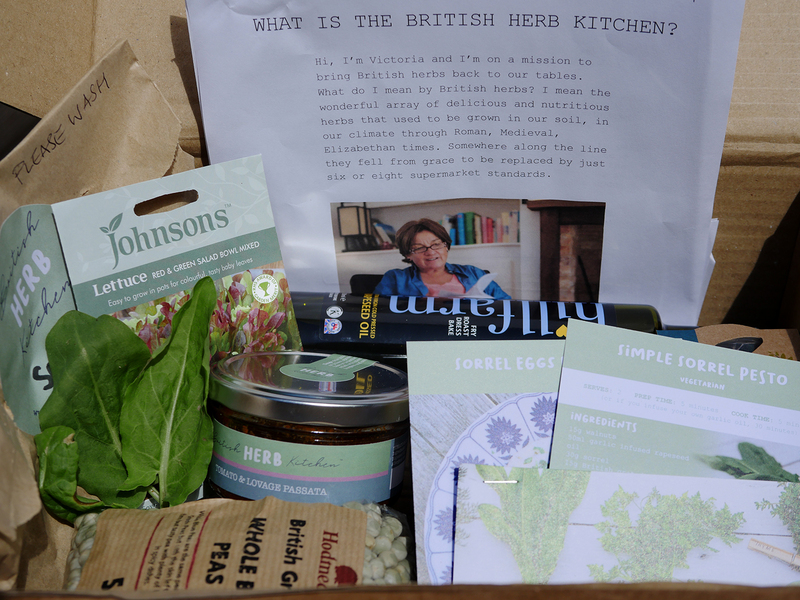 If like me, you have a passion for great British cuisine you’ll understand why I’m so excited to be reviewing The British Herb Kitchen. Victoria, the founder, says that she is on a mission to bring British herbs back to our tables. Now, I have to confess, I don’t really know the history of British herbs so I am quite fascinated to learn more about them. This particular subscription series aims to help all of us get to understand the herbs which have been grown on our soil for centuries; lovage, sorrel, sweet cicely, dittander, chervil and more. Each month focusses on British produce and a single traditional herb. This month, Sorrel, which has been cultivated for centuries. It has leaves with a sharp taste and a flavour a bit like sour wild strawberries and, I’ve only ever really touched on how to use it in cooking. Bizarrely, though I have grown herbs on my windowsill and in my backyard, sorrel is not something I have cultivated, nor have I’ve ever tried before, except in a fine dining situation. Now, thanks to the British Herb Kitchen I have no excuse. My box contained a whole assortment of goodies including fresh sorrel in two forms. A neatly packed sorrel plant, with a cardboard guard to make sure the soil stayed in place is now safely transplanted into one of my raised beds. The fresh sorrel leaves are in the fridge and I’m planning to do something with them tomorrow! Alongside the sorrel, there’s a packet of mixed lettuce seeds which I’ve already started to plant out. Tomorrow I’m planning to set up the packing box as a planter with the remaining lettuce seeds and some of my own rocket and parsley seeds. I love the idea that The British Herb Kitchen has designed their packaging so that you can reuse the box to grow more herbs! There’s a jar of tomato and lovage passata, which I can’t wait to try on some pasta and a bottle of Hillfarm extra virgin cold-pressed rapeseed oil which I’ve tried before and know I love. Hodmedod’s have provided whole blue peas which they recommend treating like a chickpea. I’m wondering if that recipe from Tony Kitous for Moussababa would work…and I’m planning to try and see. Watch this spot! And…I have to confess, Simply Seedz Roasted Pumpkin Seeds were gone before you could blink! 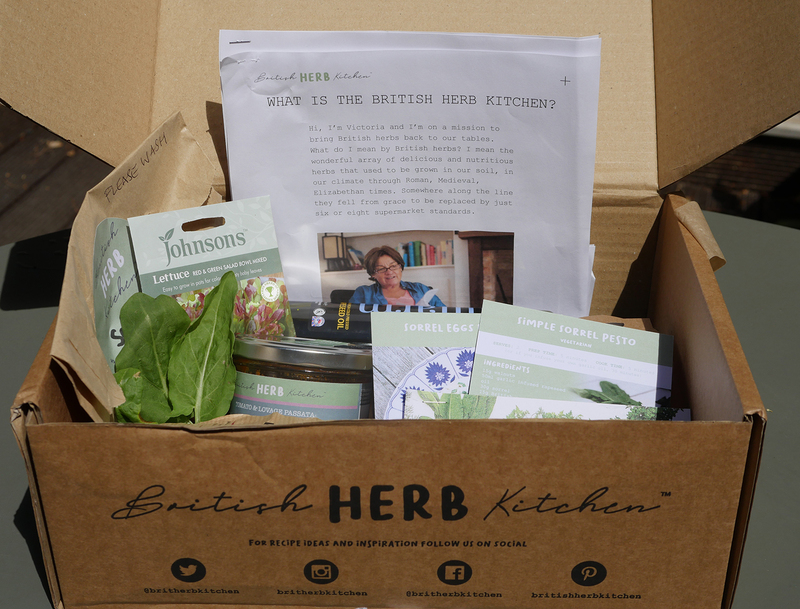 You can order your own subscription to the British Herb Kitchen or buy one for a friend – it’s around £25 a box at the moment and there are 3 month, 6 month and 12 month packages. And, you might just be lucky and win yourself a box! I have one to giveaway to a lucky London-Unattached reader (though it will contain different products to the July box). It has to be rosemary for me. Love it!